I was never looking to adopt. I had been a foster parent in the past and unfortunately, the experience did not go well. I started to accept that I had become an empty-nester, but something still felt like it was missing. That all changed the day I received a phone call from my friend Carol Sanborn, who worked in Spaulding Youth Center’s ISO Foster Care program. Carol told me about a four-year-old girl named Tori, who had special needs and had been living in a foster home for over a year. Though lovely people, her foster parents were older and could not provide Tori with the adoptive long-term care she so desperately needed and deserved. Carol invited me to meet Tori, and I was eager to do so. My mother had been a special education teacher. I have family members with special needs. I had even provided private home healthcare for children with special needs. This just felt right. I began communicating regularly with Tori’s foster parents and agreed to have Tori stay with me every other weekend for five months. The month of April came and brought new and bright beginnings, just as spring does best, and Tori moved into my home permanently. I knew from the minute Tori moved in that I made the right decision in adopting her. She fit right in with my family and everyone who met her loved her. Of course, adopting Tori came with its own set of challenges. DCYF was heavily involved in Tori’s biological family, which included Tori and three younger siblings all born to a young mother. Spaulding was also extremely invested in Tori’s case due to her significant special needs. Her biological mother made poor and unhealthy personal choices during pregnancy which had a negative impact on Tori’s health. 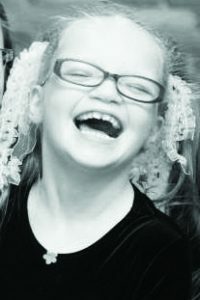 Up to this point in her life, the health care that Tori very much needed had been denied. With the support of everyone at Spaulding, we were able to overcome these challenges. It was inspirational that every meeting I attended with Spaulding and DCYF was collaborative and filled with people who truly wanted the best for this special little girl. Tori’s case worker was an instrumental piece of our success and became the very first person who Tori identified as someone who was safe and would genuinely take care of her. Tori was the case worker’s very first case and she poured her heart and soul into the adoption process. She traveled to our town (over an hour from Spaulding’s campus) to attend every single home visit, school meeting, doctor’s appointment, intake meeting and evaluation. Throughout the process, the commitment and care we received from Tori’s case worker made a huge difference in her overall health and happiness. Though it is years later, she continues to make a positive impact in Tori’s life. 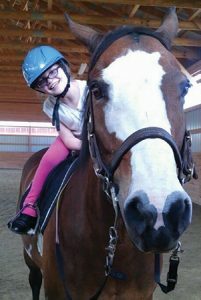 Whether at the Miss Amazing pageant, various Special Olympics events, or just taking the time to meet us at a playground, she continues to cheer her on and truly care about her well-being. For this I will forever be grateful. To the nursing staff at Spaulding, thank you for all of your help with every medical question and all of your support at Tori’s appointments. To Carol for calling me that day, thank you for changing my life for the better. To every Spaulding staff member, thank you for making all things possible for Tori and other special needs children in need of a loving home. As I mentioned, I was never looking to adopt; but I am truly grateful that I did. It has been six years since Tori came into my life and I have had a total of 35 foster kids stay with me since. There have been nights when the local police will bring a child to my door in the middle of the night because their parent overdosed. There are so many kids out there, like Tori, who deserve better than the hand they were dealt. I am happy I can provide them with a safe and loving place to stay. Although filled with happiness, sadness, and a lot of hard work, this journey is one I probably would not have embarked on without the overwhelming support I received from Spaulding. For all of these reasons and so many more, for Tori and for myself – thank you.